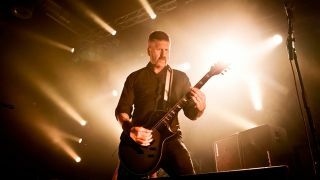 Mastodon’s Bill Kelliher admits he sometimes has to watch YouTube videos of fans playing his sings to remember how to play them himself. The guitarist says that, with a back catalogue of around 80 songs, he sometimes needs to remind himself how certain parts are played. And he takes to YouTube to watch tutorial videos of fans showing others how to play Mastodon tracks. Kelliher tells GuitarMania: “Sometimes the songs change a little bit if we keep playing them over and over. “We have 80 songs or something, so before the tours sometimes I have to go on YouTube and watch someone who learned our song and see how they play it because I can’t remember. Mastodon are working on their seventh album. Kelliher previously said the follow-up to 2014’s Once More ‘Round The Sun would have a a “darker pop” edge to it. Now he has given more information on what fans can expect on the album, which is due for release in early 2017. He says: “It’s a little bit of the same as the last album, but I think it goes even deeper in certain areas. A couple of more psychedelic parts, a little more technical parts. Mastodon play at Project Pabst in Atlanta, Georgia, on October 1.